We always knew Netflix was popular but now we have some idea how popular it is when people have the option of Netflix or traditional pay TV. Enseo is a company that enables hotel TVs to access a wide range of apps and features. 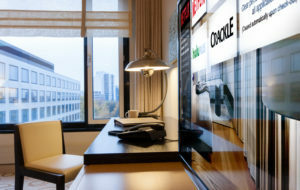 These TVs allow hotel guests to watch Netflix, YouTube, Hulu, Crackle, and other services through their hotel TV. Enseo has released a report on what people were watching during the period of October 1, 2016, through December 30, 2016. According to this report, which looked at percentage of time viewing each channel and service, people watched Netflix more than ESPN, Fox News, CNN, FOX, CBS, ABC, and HGTV. YouTube was more popular than MSNB and TBS. Hulu and Pandora were more popular than AMC and Bravo, and Crackle was more popular than The Disney Channel and the Hallmark Channel.